Supergirl Season Three is a concise and thoughtful storyline that was easy to follow and an ending that was clear to the audiences that Supergirl will return for a Fourth season. As always, DC knows how to bring the superhero to the screen. Supergirl is one of DC's more recent television endeavors, having completed its third season and having audiences waiting on pins and needles for the upcoming season. As in the prior seasons, Supergirl is a story rich in relationships, romances, and sci-fi. By the end of the third season, Supergirl broke our hearts, mended them, and broke them all over again. With the advent of the third season, we were introduced to new characters and become more familiar with some old beloved characters. Most importantly, the recurring storyline centers around Kara Danvers/Supergirl (Melissa Benoist; The Longest Ride) trying to figure out who she really is and what her role should be in the world. Working with her sister, Alex (Chyler Leigh; Grey's Anatomy); Martian Hank Henshaw (David Harewood; Doctor Who); and Lena Luther (Katie McGrath; Jurassic World), the team tries to defeat the Worldkillers, specifically Reign, portrayed by Odette Annable (House, M.D.). Like Benoist, Annable plays two characters in the show and does a remarkable job flipping from the mother of the year to the alien who wants to destroy the world. With Reign unable to take care of her daughter, Alex received a wish this season. She knew she wanted to be a mother and while Reign was terrorizing the Earth and being held in Lena's lab, Alex was able to step in and take care of Ruby (Emma Tremblay; The Giver). Season Three also brought some tears, where we said goodbye to Winn Schott (Jeremy Jordan; The Last Five Years), our super genius tech, always creating new types of devices to help our favorite woman superhero. Winn literally flies to the future with a sketch he made in present time that actually becomes a relic in the future. Also flying back to the future is Mon-El the Daxam Prince (Chris Wood; The Vampire Diaries) who finally confessed his undying love for Supergirl but leaves her, nonetheless. We also said goodbye to our favorite Martian dad, M'yrnn J'onzz (Carl Lumbly; Cagney & Lacey) who sacrificed himself to save Earth. M'yrnn's storyline was unique to this season- the writers showed how Earth looks to a newcomer and all the goodness that still exists in people and the world. The writers touch on how a son must care for his aging father- one with a sickness similar to what Earth would call Alzheimer's and how families are affected. In true Supergirl fashion, the team banded around J'onn and M'yrnn to show a united support system. It seems as if each season, the writers tackle a unique family issue and it brings something meaningful and deep to the show. As usual, Supergirl's casting director made excellent choices. One of our favorite newcomers to Season Three is Jesse Rath (Defiance), who plays Brainiac-5. Always pointing out how Winn wasn't as smart as himself, Brainiac stays on Earth to assist with Winn's position, since Winn flies to the future. Rath is an amusing character and brings a lightness to the storyline that is sometimes much needed. The Blu-rays are presented in 1080p HD resolution with an aspect ratio of 1.78:1. The special effects used with Reign locked in Lena's lab are clear. The colors pop and are crisp. The blackness used to emphasize Reigns world contrasted against the lightness of the new Krypton are impactful. The audio is presented in DTS-HD Master Audio 5.1. Background noise is to a minimum without having to strain to hear the dialogue. Special audio effects with the Worldkillers and Supergirl's fights are clear. Sound effects are well placed. Overall, it is a pleasant auditory experience. The special features can be found on the Blu-ray and are always a treat to watch. Disc 1 contains Deleted Scenes in all episodes on the disc (Episodes 1-7). Disc 2 brings us a Special Feature regarding the crossover events – Inside the Crossover: Crisis on Earth-X. Disc 3 also brings us deleted scenes in Episodes 14, 16, 17, 18, and 20, along with a wonderful Gag Reel. The final disc in the set, Disc 4, contains deleted scenes in Episodes 21, 22 24, 26, as well as Special Feature- The Best of DC TV's Comic-Con Panels San Diego 2017. This past season, Warner Bros. took a little hiatus during the Spring season, and we wondered if this would be the end of Supergirl. Thankfully, the show returned in Season Three with a concise and thoughtful storyline that was easy to follow and an ending that was clear to the audiences that Supergirl will return for a Fourth season. 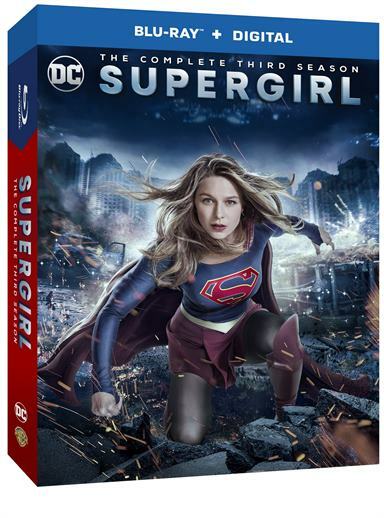 Supergirl: The Complete Third Season is a wonderful addition to your home entertainment collection. Download Supergirl: The Complete Third Season from the iTunes Store in Digial HD.